WELCOME to the Clay County IAGenWeb Project, part of a volunteer effort of the USGenWeb Project. Our goal is to facilitate access to records and information of a genealogical nature for Clay County, Iowa. My name is Kris and I am the coordinator for Clay County. Volunteers are needed and contributions are welcome. If you have any suggestions, corrections or additions for these pages, please contact Me..
By an act of the legislature in 1851 Clay County was created. Clay County was named after Lieutenant Colonel Henry Clay, Jr., of the Mexican War. Initially Clay County was attached to Waukan (now Woodbury) County for revenue, judicial and election purposes. The earliest settlement in what is now Clay County is thought to have been in 1856. The first actual settlers were undoubtedly the Kirchners and Ambrose S. Mead at the present site of the town of Peterson. During the same summer, 1856, a number of others arrived and settled within the present limits of Clay County. George Gillet and brother came and located at what has since been known as "Gillets Grove." Ezra Wilcox arrived and took a claim near the mouth of Willow Creek, in what is now Herdland township. In the fall of 1858, early settler Charles Smeltzer, drew up and circulated a petition among settlers who signed it requesting that Clay County become a separate organization. The petition was granted and election of officers was held October 12, 1858. The election was held at the house of Ambrose Mead in Peterson. The first county seat was located in Peterson where it remained until 1871. 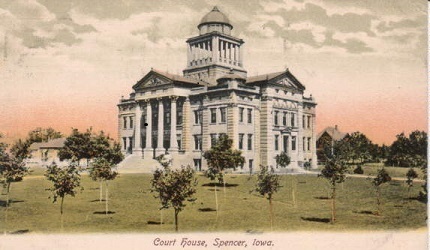 In 1871, the town of Spencer, named after George E. Spencer, was formally laid out. Since it was more centrally located than Peterson, the county seat was moved after voters elected to do so in an election held in October of that same year. In 1878 the first railroad was built through Spencer and in less than a year the population grew to 1000. The Clay County courthouse, built in 1901, still stands. The population of Clay County in 2012 was 16,599.